"Hello Master Chef! My kids LOVE beets. We eat them plain or as a salad with goat cheese. I need a great summer beet recipe. Do you take requests?" The more I thought about it, the more I realized that a majority of recipes involving beets are some sort of salad! Not that there is anything wrong with that, but can't we get a little variety up in here? I've been sitting with this on my plate for a few weeks now, not sure where to take it. The majority of my research resulted in salad recipes. Fail. Yes, I found some salads that got my salivary glands working, but I couldn't let myself give a follower a salad recipe, not today at least! I wanted to provide her with another option. Blogs have become my obsession. My blog, food blogs, music blogs, style blogs. They are everywhere. Haunting me. I stay awake until the wee hours of the morning writing, looking at blogs, and writing some more! I am not sure how I am still functioning. However, one big plus to this recent obsession is the mass influx of recipes that allows my creative juices to start flowing... While scouring the internet for recipes I came across one for latkes. I thought to myself, why can't I switch out the potatoes for beets? Or even better, MIX beets with sweet potatoes! Hello genius. So, there was my idea for beets. But what would I pair it with? A meal of sweet potato and beet latkes alone would be boring. The beet latke recipe I found came from Bon Appétit and then I did a little switching around of my own. Hope you don't mind Bon Appétit! "Sweet potatoes...beets....sweet potatoes.....BLACKBERRIES!" I remembered seeing a recipe on How Sweet It Is for a blackberry salsa. It had to taste good together. I decided to pair it all with grilled pork chops. Nothing elaborate there - we already had enough going on with the latkes and salsa! I love to pair some kind of fruit with pork chops which have a tendency to be a little drier than other meats. I. love. beets. Yes, they are a weird food, I know, I know. But why are so many people skeptical? STOP IT! There is no reason to be scared of these vegetables. If you don't like them by themselves, then don't eat them by themselves! I think that is why I love this recipe so much - you definitely get the flavor of the beets, but it is enhanced by the combination of sweet potatoes, cumin, coriander, and the rest of the spices. Don't be surprised if you come across more beet recipes in the future. In fact, I know that I will be doing a post on juices - ABC Juice? Yup, that is my favorite. Apple. Beet. Carrot. I freaking love the farmer's market. You will find a "how to shop a farmer's market" post jumping out at you sometime this summer. It would be dumb to think that it's not going to happen... I am so enthralled by the atmosphere at farmer's markets. They feel like a community in and of themselves - venders all coming together to share their fresh produce and products with people. You are surrounded by individuals just like you - people looking for inspiration, fresh produce for that day's meal, or simply going for a good morning's walk! I am starting to feel like a walking billboard for kitchen gadgets! Is it just me, or am I advertising a new gadget every week?! But seriously...this one's cool! Crap...the next two are cool! Say hello to my little friend, the Jalapeño Corer! He is my new best friend. Have you ever tried to core a jalapeño or pepper? It's annoying. Scraping out the seeds and innards. This tools does all of that for you! NEVER TOUCH YOUR EYE AFTER HANDLING JALAPEÑOS! There was already quite a bit going on with this meal, but I came across these at the farmer's market. Have you ever in your life heard of RED carrots? I had not. They are very similar to normal carrots, but they tends to be a little sweeter. Hello inspiration for a salad. I chose not to peel the carrots because I didn't want to lose the gorgeous red on the outside. If you do this as well, just make sure to wash them very well and pick off the little hairs. I threw the lettuce, also from the farmer's market, into a bowl and mixed it with the red carrots, some red onion, cucumber, and feta cheese. Top it off with a little balsamic vinegar and voilá! As far as the pork chops go - lightly season them with salt and pepper and grill them. Easy as that! 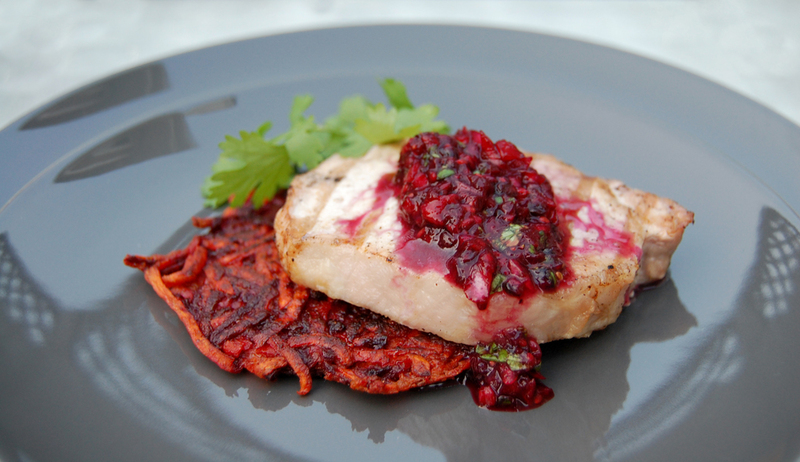 Pork Chops with Sweet Potato and Beet Latkes with a Blackberry Salsa! A very special thank you to our Minnesota follower who requested this! I had so much fun putting it together. It really is a delicious meal and I hope you and your family enjoy it as much as I did! Combine all ingredients together in a bowl and mix. Place beet in large bowl; press with paper towels to absorb any moisture. In another large bowl, whisk flour and next 5 ingredients. Mix in beets, then eggs.